The NLP and Neuro-semantics course. Three days to access your mind’s potential with the two founders and directors of the Neuro-Semantics Institute in Italy. Learn how to create success in every area of your life with Neuro-Semantics, the most advanced part of NLP and receive a degree in Meta-States given by the International Society of Neuro-Semantics (USA). Every professional athlete and every high-level business man knows the importance of mental conditioning, of positive attitude and focused attention. If you think that your education and life experiences have been useful to you up until now, just wait and see what happens when you learn how to manage your brain in a highly professional way. It’s easier than you think! Your brain is like a huge computer that wants to please you and it will do anything you want if you talk to it in its own language. This language is Neuro-Semantics, the most advanced science in the way of mental performance. It’s the science about the structure of your experience, how you think, how you feel emotions, how you act, how you encode meanings into your body-mind system and how to improve all of the above. Stop and ask yourself: Could my brain serve me better? Accessing Personal Genius is a complete course for personal transformation or professional development. In addition, it offers essential techniques and abilities for those who want to become a coach. You will learn the theory of Meta-States and the practical application of Neuro-Semantics, including the 14 exclusive models to train yourself and others for excellence. – If you want to reach more satisfying results in your life. As a “genius” you will gain more awareness, the ability to access states of body-mind excellence and more intentionality in transforming what you say into what you do and who you are. 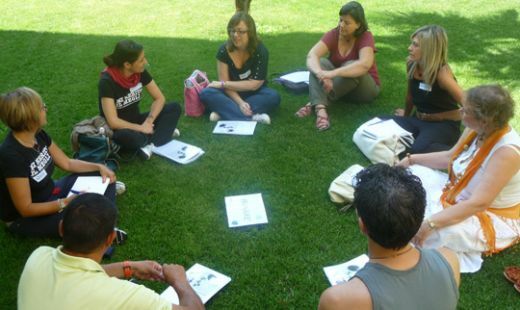 Here are the main themes, each one of them is developed both through a theoretical and a practical point of view through games and exercises for individuals and groups, led by Lucia Giovannini and Nicola Riva and the assistance of team leaders. In addition, you will receive a complete 90 page manual. There are no words to express what I’ve discovered, felt and learned during APG...I’m so happy, at every L’UCE weekend I feel richer and I keep on thanking myself for the decision I made to start this path. Having been raised on NLP (and transitional analysis training) I have to say that it has been a really interesting weekend! Neuro-Semantics has several practical applications more direct and focused than NLP that allow me to enrich my knowledge with all these new interesting tools.